This fine porcelain plaque, by the prestigious German manufacturer KPM, features exceptionally well-painted details set in a majestic, giltwood frame. Heinrich Hofmann (German, 1824-1911) was a painter celebrated for his works depicting the life of Christ. 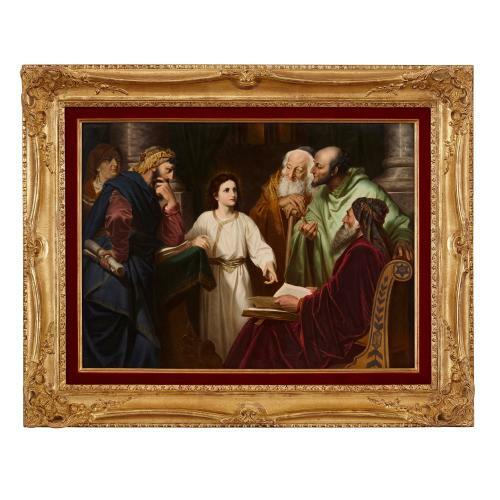 This porcelain plaque is painted after one of his most famous masterpieces, 'Christ in the Temple', which depicts a story taken from the Gospel of Luke. 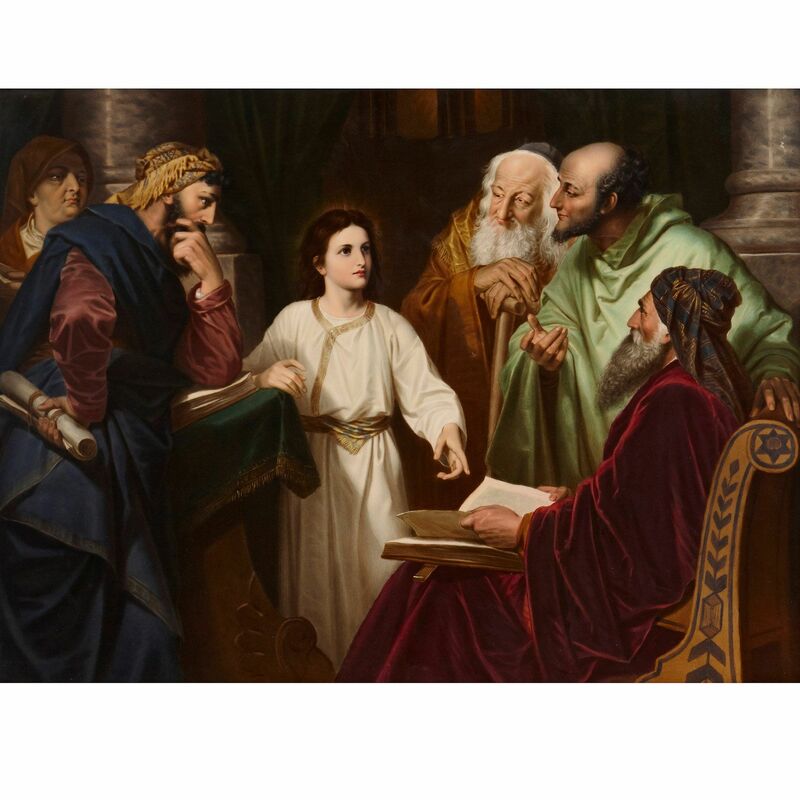 Often also called the 'Finding in the Temple', 'Christ among the Doctors' or the 'Disputation', the story tells of the twelve-year-old Jesus, accompanied by Mary and Joseph and their relatives, who pilgrimage to Jerusalem on the occasion of Passover. 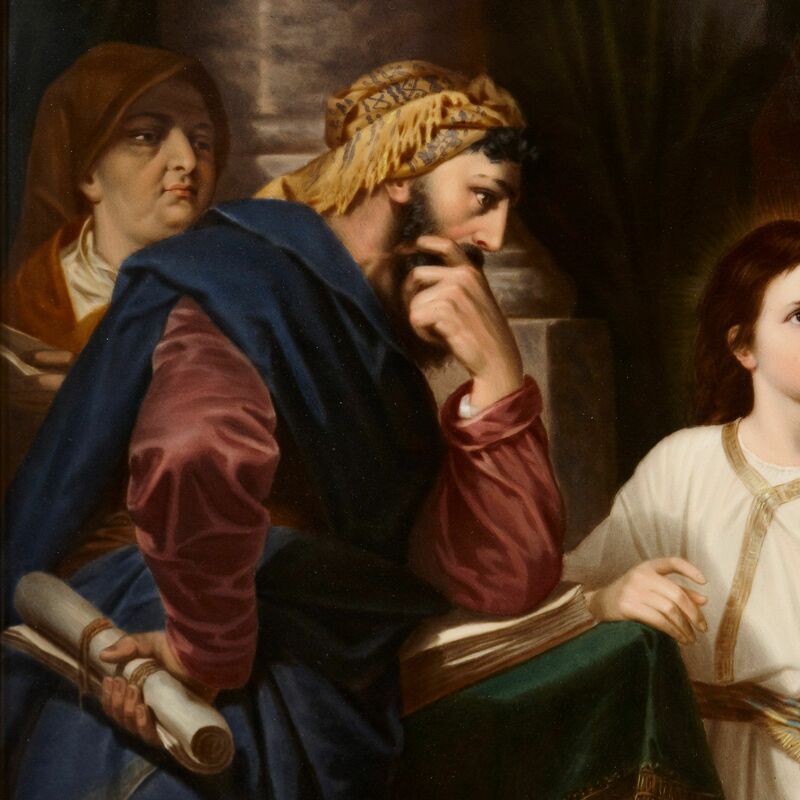 On the day on which they were supposed to return, Jesus stayed in the temple, and the group, thinking he had left with them, began their journey back home. After a day, they discovered he was not with them, and so returned back to Jerusalem. 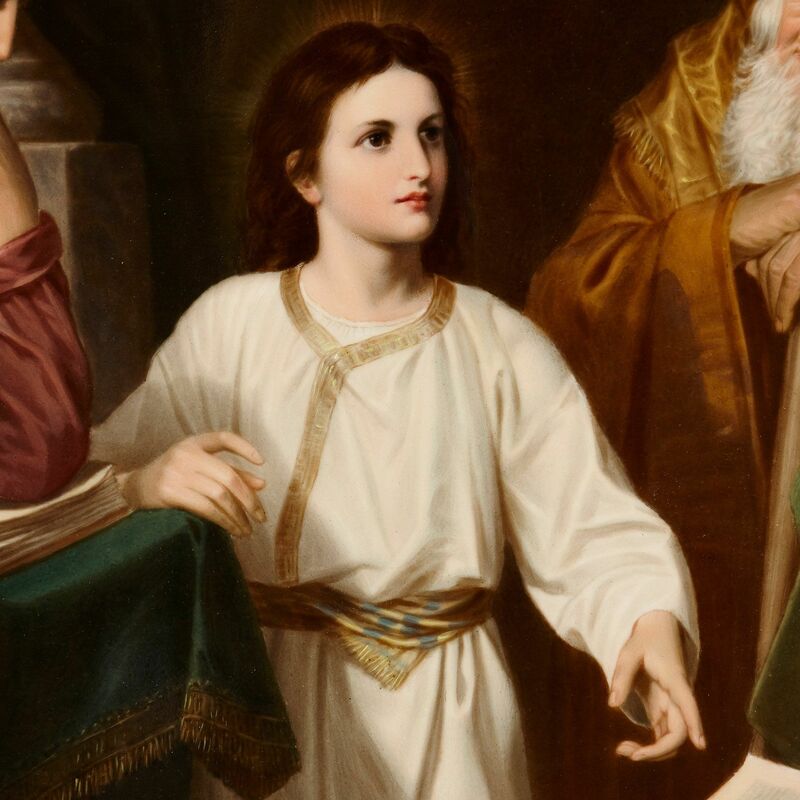 They found Jesus three days later in the temple speaking with the erudite elders, who were astonished by his intelligence despite his young age. Mary was cross that Jesus had become lost, and Jesus said to her "How is it that you sought me? Did you now know that I must be in my Father's house?". The painting by Hofmann, and this KPM plaque, depict the scene which Mary, Joseph and Jesus's relatives saw when they returned to the temple. 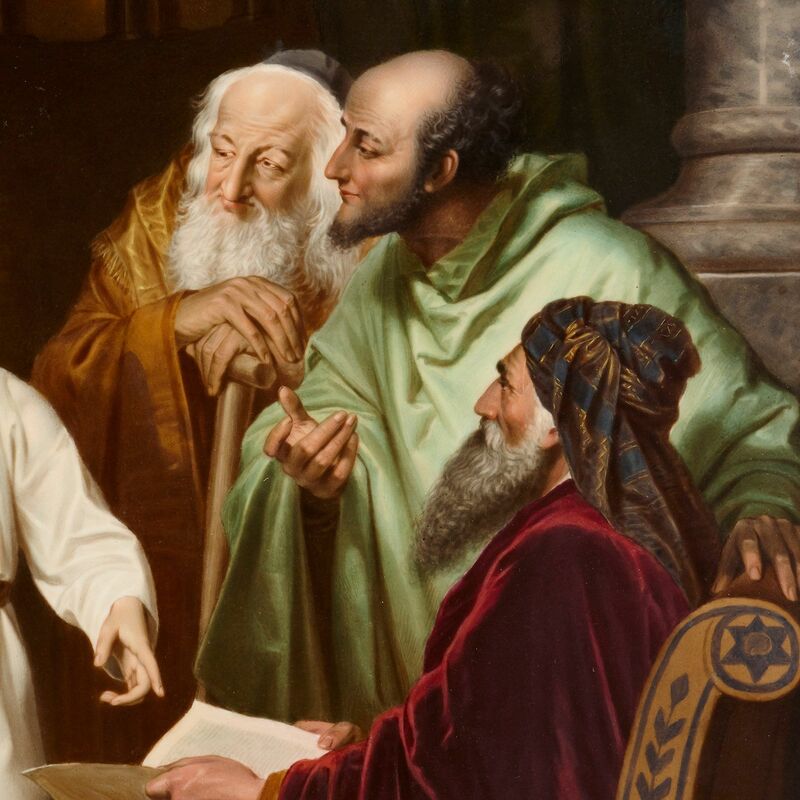 The composition shows a young Jesus to the centre, dressed in white and brightly illuminated by light, gesturing to a book as he is surrounded by older, cloaked men. The group, set among colossal columns, listen to Jesus as he speaks. The painting makes use of the famous technique of chiaroscuro, a method of painting invented by the Baroque painter Caravaggio (Italian, 1571-1610) which involves contrasting bright, illuminated whites with dark, intensely shadowed surroundings. 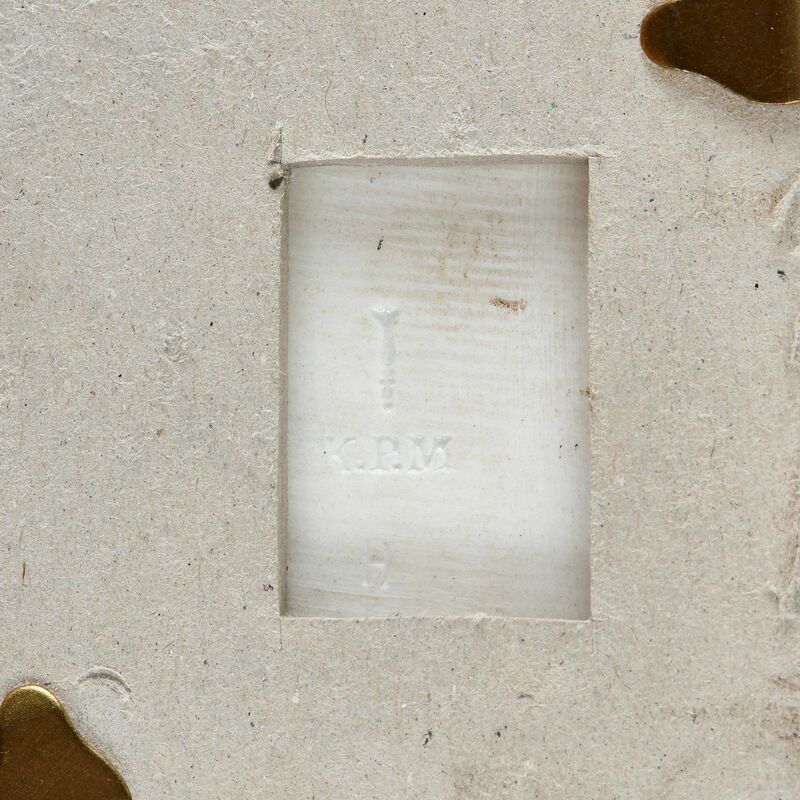 The porcelain plaque is marked to the reverse with the impressed monogram of KPM and the sceptre mark, and set within a large and fine giltwood frame.